Our Ferrari F430 Test Drive is an amazing and hands-on way to experience a Ferrari. Take your seat, push start and go. The sound from the engine is like music and the power of this super car is addictive. A Ferrari trainer co-pilot will assist you, teach you, and let you really experience all the horse-power this F430 can offer, 0-100 km/h in 4 seconds! A Ferrari co-pilot will ride beside to make sure you get the most out of your drive. Zoom through the streets of Maranello and feel the power of this car. 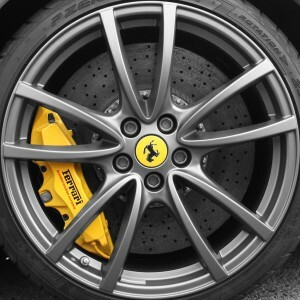 With our Ferrari F430 Test Drive, you choose your amount of drive time, from 10 minutes up to 2 full hours. 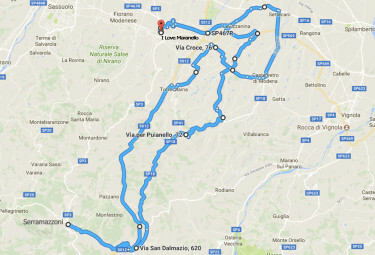 The route will depend on the chosen driving time; the longer time the more beautiful countryside, great curves and higher speeds. 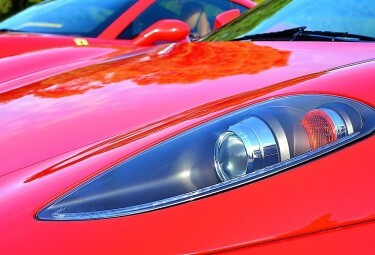 Your Ferrari Test Drive will be recorded by an internal camera. After your thrilling drive you will receive your DVD. What better souvenir to bring back home and show your friends? You will also receive a signed Diploma, certifying that you have completed your Ferrari test drive training. Would you also like to experience a Ferrari Formula One car? 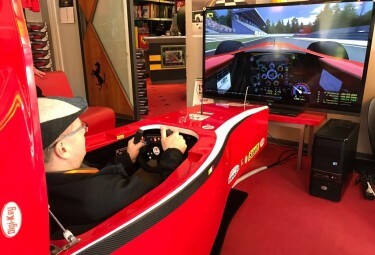 No, problem, Ferrari F430 Test Drive includes 15 minutes in the original Formula One simulator. Special note about the tour: *The Ferrari F430 is a two-doors coupe with two seats. It features a 4.3L V8 gas engine. The engine’s output specifications are: 490 PS. The top speed is 200 mph (320 km/h) and the F430 can accelerate from 0 to 62 mph (100 km/h) in 4.0 seconds. *If you wish to bring a passenger with you on the Ferrari Test Drive, we recommend you to book the Ferrari California option. This Ferrari model has a backseat. 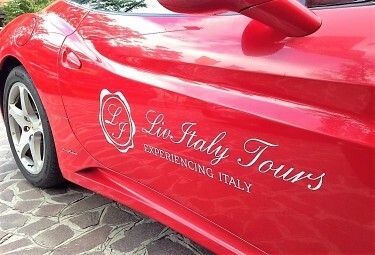 *LivItaly Tours is proud to offer an exclusive red vehicle. Our partnership guarantees that we are the only suppliers in the entire motor-valley with this color. *The 2 hours option will also include a complimentary ticket to the Ferrari Museum of Maranello. This will be given to you directly from our staff in Maranello. 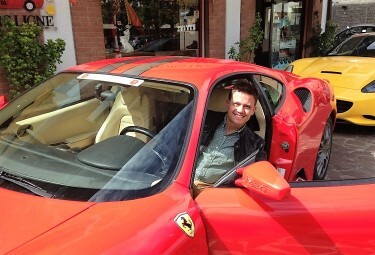 Speed down the streets of sunny Northern Italy with an expert Ferrari co-pilot! Experience just how fast the Ferrari F430 is during your drive around the Italian countryside. Re-live the moment with a DVD recording of your driving experience from the internal go-pro! After your drive, you will be able to enjoy a 15 minutes test of a Formula 1 simulator! 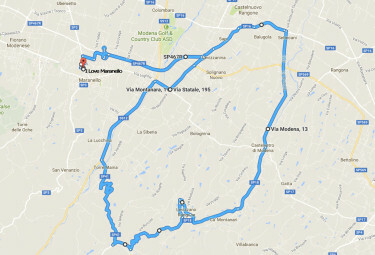 Enjoy a 10 minute test drive around this route in Maranello. 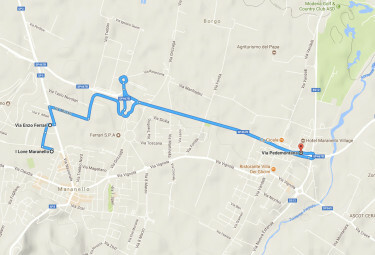 Take a 20 minute test drive of your Ferrari F458 Italia or Lamborghini LP570 around this route. 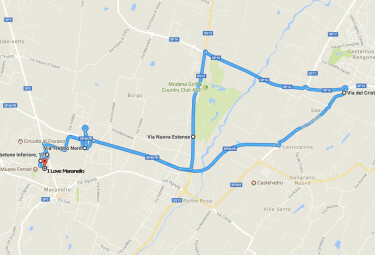 Extend your drive with a 30 minute test drive around this route in Maranello, the home of Ferrari. Have a truly memorable time by expending your drive to 60 minutes and taking this route. 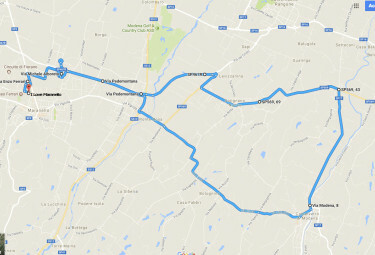 Make the most of your test drive by extending your drive to this 2 hour route! Final price includes: Red Ferrari F430 (only one driver), Ferrari F1 Simulator (15 min), DVD, Diploma, Taxes, Third-party liability insurance, Ferrari co-pilot. Qualifications: Renter must be at least 18 years old. Renter must provide a valid driver's license, with minimum one-year experience. Maranello can be difficult to reach without your own car. We offer round-trip transfer services from Modena and Bologna. Both cities are served with convenient train stations. Please provide all necessary information about your hotel or your train schedule in the "Additional Notes" box during your booking process.